How Is This Hot Air Being Photographed? There are plenty of reasons why people might want to photograph air, but not too many methods to do it. 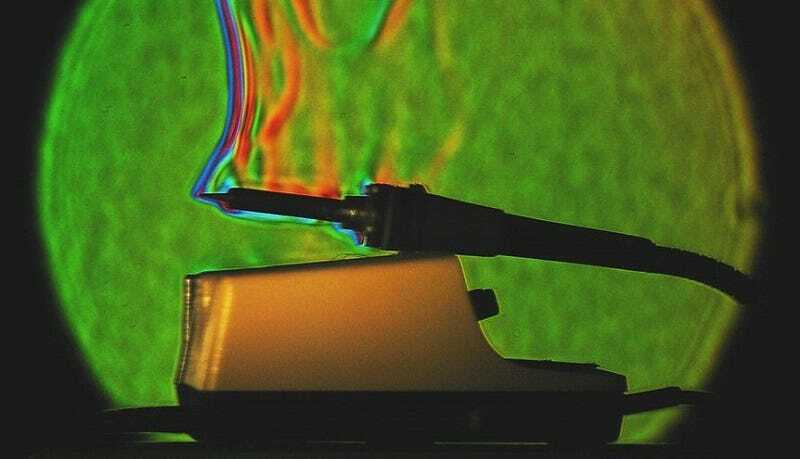 This is an image of hot air rising off a soldering iron, and you can see it because of Schlieren photography. Air can move things around for some dramatic photos, but on its own it’s pretty camera shy. Looking for a way to observe the dynamics of air, August Toepler found a way to photograph it in 1864. He filtered the light meant to hit the object so it was collimated. Collimated light is light with waves that are all going in the same direction, parallel to each other. This light spreads very slowly—it’s a sort of precursor to the laser—and so any disturbance to the light is noticeable. As air gets hotter, it gets less dense. In general, light takes a longer time to get through more dense substances than less dense. So as the light passes through density changes, it distorts. Toepler put the focal point of the light near a very sharp object – generally referred to as a knife edge. If the air that the light passed through experienced a density gradient, it would distort and be blocked by the knife edge. This would cast shadows on the photograph, and let people see where the density gradients of the heated air lay.